Dad, have you seen my Math book? I think I still have homework to do. Mom, I have no clean underwear. I really don’t want to go commando to school. Dad, can I borrow ten dollars. I don’t have enough money for that new shirt I want. Mom, I don’t have enough gas to get back and forth to school plus the mall. Can I get twenty dollars? Dad, how long would you cook this dinner in the microwave? Mom, what time was cheer practice this week? No, I am being serious. I am failing as a parent. The school has been doing their part and teaching basic reading, writing and arithmetic. The church has been doing their part and help developing a relationship with God and others. The coaches are even doing their part and teaching them how to work as a team. I have helped out with all these areas as well too. 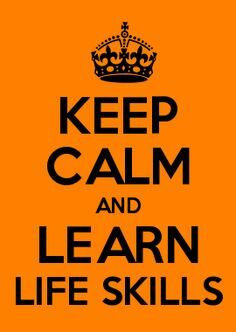 But what I have been lacking is in life skills department. Those skills that help us with independence, money, organization, time management, decision making, relationships…those everyday skills that adults sometimes take advantages of. After sitting down with the four, I realize there are a handful of Life Skills that they have not yet grasped yet. We have came up with 30 different Life Skills that we would like to work on over the next year. Some of them are geared towards the two older ones, and others are geared towards the two younger ones. Do a quick mental assessment of your kid’s basic life skills knowledge. There are no set rules on what age your kid should know when. It is the judgement of the parent. Then sit down with your kid, talk to them about things that they found interested in learning. Then go from there. As parents, we want to prepare our kids for the “BIG World“.